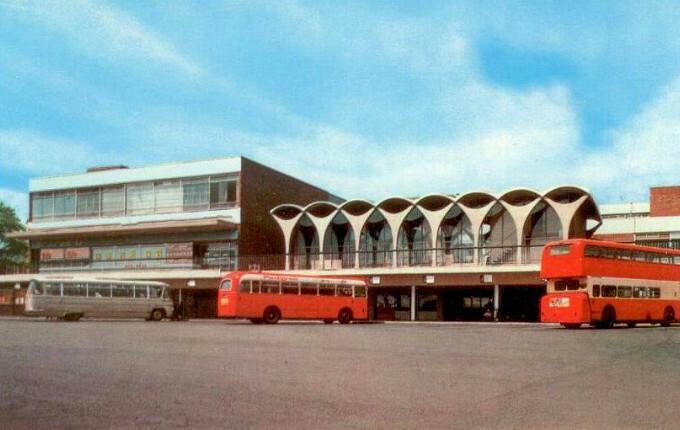 The Last Bus was a weekend of visual arts activities, performances and films commissioned to mark the final demolition of Hanley bus station. It was part of the Artcity programme of temporary cultural activity in vacant and abandoned buildings and spaces in Stoke-on-Trent. Artist collaboration Rebecca Winwood and Ruth Bridges invited you to join them for the Requiem to a Bus Station. .
Laura Potter-Dunn, illustrator and textile artist created a large-scale tapestry which depicts her memories from the old bus station as she grew up in Stoke. The tapestry featured a couple whose engagement she witnessed in 2007. Artist, poet and producer Martin Gooding has been collecting mould and debris from the old bus station site. His piece, ‘Anchors’ looked at the eco-systems of abandoned spaces and the meaning of abandoned objects – a forgotten suitcase, a blown-out bus tyre, a buckled shopping trolley. Stoke-based independent film production company Chinwag Films created a brand new short film The Angel of Goldenhill the story of how a fleeting encounter between two strangers at a bus stop changes each of their days. There were other artistic interventions from Artcity partners Cultural Sisters, Restoke, B arts and Letting In The Light. The Last Bus was curated by Siobhan Mcaleer and produced by Isla Telford.